“Woo Sing family portrait,” 1898, Chinese Exclusion Act case files, RG 85, National Archives-Seattle, Charles William Sing file, Seattle, Box 1070, Case 8787/3-8. This photo was taken in Richmond, Virginia about 1898 of the Woo Sing, his wife Sue King, their son Charles William, and their daughter. Charles William Sing, born 16 November 1895, was said to be the first Chinese baby born in Richmond, Virginia. 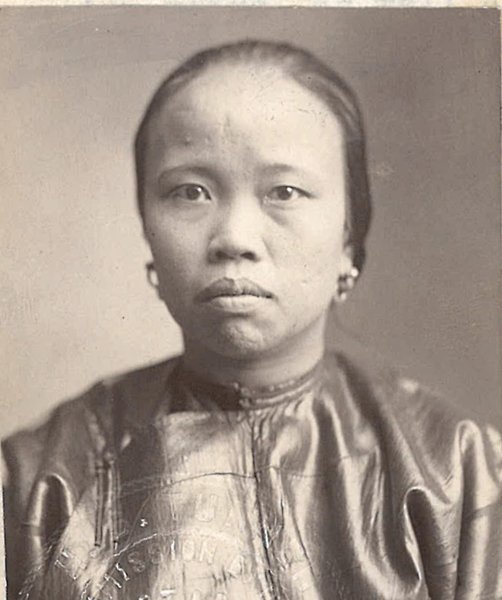 [In 1908, the Acting Chinese Inspector stated that the Department of Health did not records birth in the City of Richmond during the years 1888 to 1900.] Woo Sing, knowing that his son nativity might be questioned in future years and his rights under the Constitution may be endangered, had several affidavits recorded in Chancery Court. 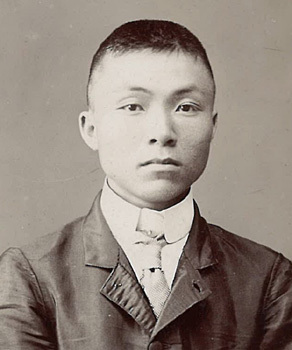 Woo Sing stated that he was born in China and came to the United States in 1875 at the age of nine, married Sue King, of Chinese descent, but born in San Francisco. They were married there according to the laws of the State of California. They moved to Richmond about 1894 and lived at 2 South 7th Street. He set down the date of his son birth in Chinese and that statement was attached to the affidavits of the attending midwife and two persons who knew him personally. His affidavit was signed 28 April 1898. He paid $1.75 in filing fees. Minetree Folkes, a Notary Public for the City of Richmond, certified Woo Sing’s document. Walter Christian, Clerk of the Hustings Court of the City of Richmond, certified Folkes’ qualifications. Caroline Claton, a colored woman, swore in an affidavit that she was a midwife, resided at No. 4 Jackson Street, Richmond, and that on 16 November 1895; she attended to Woo Sing’s wife in the birth of a male child afterwards called Charles William. Jefferson Wallace swore that he had his linen washed at the laundry of Woo Sing, sometimes called Hop Sing, He knew Woo Sing four or five years, knew that his wife bore a male child in the autumn of 1895 and the child was named Charles William Sing. Bettie T. Hayes, residing at 817 Floyd Avenue, Richmond, swore the Woo Sing was her tenant and that she has no doubts about the time and place of the birth of Charles William Sing and that his mother brought him to her house on numerous occasions. These statements were admitted to record on 8 August 1899 by Charles O. Saville, Clerk of the Court of Chancery. The documents were recorded in Deed Book 166 “B”, page 63. On 19 April 1911 Woo Sing, also know at Woo Yip, testified that he was 46 years old, a cook, and living at 655 West Highland Drive, Seattle. His wife and son and daughter were living in China. His statement was in reference to his son, Charles William Sing, coming to Seattle to live with him. Charles, age 16, arrived in Seattle on 15 April 1911 and was admitted. He went back to China in 1913 and 1927 for visits. The final document in his file shows that he was re-admitted on 23 April 1928. He was married. His married name was Woo Gong Jim; his Chinese name was Woo Gong Foon. He had seven children—four sons and three daughters, age 8 to 2. The oldest was born in China and he was staying in Seattle. The others, all born at 1023 King Street, Seattle were going back to China to attend school and return later. He had birth certificates for the children born in Seattle. The Richmond Dispatch, a Richmond, Virginia newspaper published an article, “Woo Sing Has a Son. He paid $1.75 Yesterday to Certify to this Fact. An [sic] Unique Paper Filed in Court” on 9 August 1899. “Richmond-Born Chinaman is Denied Re-Admission,” The Richmond Dispatch, Richmond, Virginia 24 September 1908, p.10, col 1. “American Chinaman Barred,” Appomattox and Buckingham Times, Volume 16, Number 48, 30 September 1908, p7, col. 2.